250 delicious vegetarian recipes plus information on the health benefits of a vegetarian lifestyle. We choose a vegetarian lifestyle for various reasons, and perhaps one of the most significant is that a plant-based diet is healthful. Many current studies show that the fiber, minerals and other nutrients found in such foods play an important role in preventing disease. 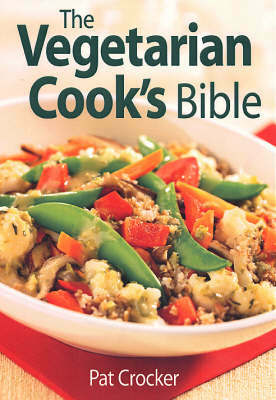 This cookbook offers up a vegetarian diet that is rich, varied, healthful and delicious. The recipes call for an interesting range of food choices and are often both budget friendly and spontaneous. Warm mushrooms with goat cheese is a recipe that ties in with research showing how shiitake mushrooms bolster the immune system.The author explains that cruciferous vegetables protect against colon cancer-and provides a recipe for a hearty stuffed braised cabbage with potatoes.A special section addresses seven body systems and suggests prescriptive meals and beneficial dietary and lifestyle changes. In The Vegetarian Cook's Bible, imaginative recipes and comprehensive, up-to-date information highlight the benefits of vegetarian cooking.